Merry England before the Modern Age. Charting the progress from the communal year and it’s festivals both sacred and secular towards a more centralised control and ensuing decline of festival times, holy days, rituals and revels. The Protestant Reformation and its austere Puritanism is clearly the largest single cause which drew to a close earlier ‘Papist’ traditions of the Catholic imbued culture that had supported spiritual ritual and secular pagentry for hundreds of years. To set the context, the English Reformation under Henry VIII had broken the Church of England from the authority of the Pope and Roman Catholic Church. From 1553, under the reign of Henry’s Roman Catholic daughter, Mary I, Henry’s Reformation legislation was repealed and Mary sought to achieve the reunion with Rome. Following Mary’s childless death, her half-sister Elizabeth inherited the throne. As Elizabeth could not be Catholic, that church considered her illegitimate, communion with the Catholic Church was again severed by Elizabeth. Elizabeth’s reign saw the emergence of Puritanism, which encompassed those Protestants who felt that the church had been but insuficciently reformed. Puritanism ranged from hostility to the content of the Prayer Book and “popish” ceremony, to a desire for church governance and inded for society at large to be radically reformed. The Civil War broke out less than fifty years after the death of Elizabeth I of England in 1603. 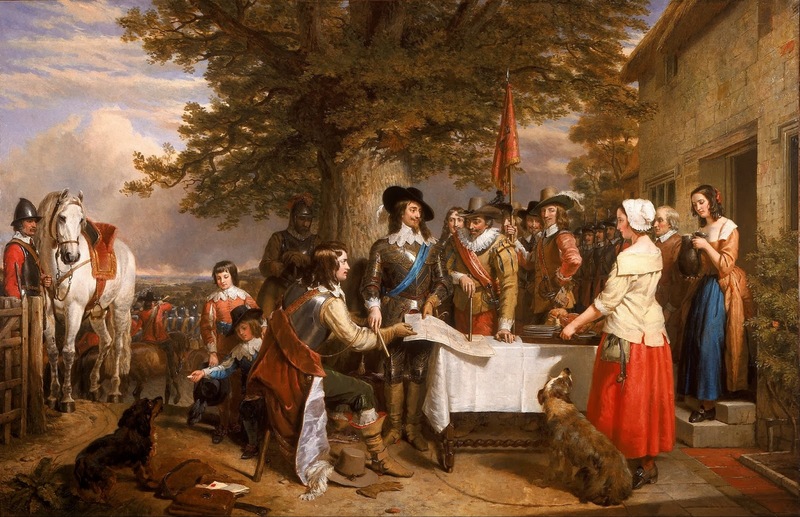 The English civil war was far from just a conflict between two religious faiths, it had much more to do with divisions within the one Protestant religion. The austere, fundamentalist Puritanism on the one side was opposed to what it saw as the crypto-Catholic decadence of the Anglican church on the other. Divisions also formed along the lines of the common people and the gentry, and between the country and city dwellers. 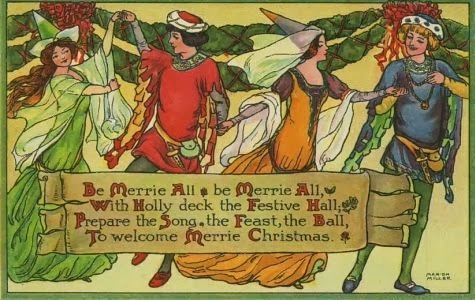 In this politically charged and religiously swaying environment, alternately pushing an oppresive new religious austerity or inclusively reinstalling the traditional milieu of sacred and secular traditions of British life, the festive, communal culture and its traditions waned and dwindled. Each fresh onslaught of punitive policy and legal measures gradually depleted the social enthusiasm which had bound the culture together in earlier times. Among the church rituals and communal activities considered innapropriate by the changing authorities, was the ornamentation of churches with garlands at festival times such as holy and ivy at christmas, the lighting of candles below icons, boy bishops and their processions, church ales which collected money for the church rituals, rogation or blessing of fields at spring, appointment of lords of misrule to preside over festivities, morris dancers, musicians and dancing at may poles. The time afforded such holy days and communal activities had also afforded an ocassion to gather in dissorder and this sometimes developed into protests against government restrictions and taxations. The earlier potent mixture of rituals and revels, pagentry, music and costumes, wholesome earthy fun and good humour which had been accepted as such by the long interwoven traditions of populace with Catholic church, was uprooted and destroyed by the ardent and extreemly keen Protestants to such an extent that various of the ensuing Crowns sought to ammeliorate on behalf of the people and their traditions but with little success. The decline continued under the fervant Protestant condemnation of such frivolities and lewdness as dancing, singing and even laughing – quelle horror! Protestant authors and clergy persued their ‘souless’ and mirtless New World Order replacing a sacral Catholic yearly cycle with secular and anti Catholic new Protestant celebrations such as of Nov 5th (Guy Fawkes night), and Royal birthdays/Accessions etc. The dissolution continued under the rising agrarian capitalism and nascent industrialism. Highly recommended reading for any who are interested in the cultural connections between the ‘old religion’ (which actually meant the all embracing ‘magical Catholicism’ of early medieval England – and amongst these traditions were many pre Christian survivors ) and the Protestant modified puritanical exegesis and transformation of a formerly Merry England into a more dour, serious, self effacing, God fearing nation, under the varying vagaries of the Parlaiment and it’s often relentless officers. It may be hard for us now to imagine the full extent of a medieval and earlier pagentry imbued Britain, alternately revelling and worshiping its way through the sacred year, with churches drawing on hundreds of years of iconography decoration to embellish and add impact to the many sacred days and rituals which were widely observed, town and merchant guilds hosting processions of costumed and robed actors, with giants, dragons and unicorns represented in huge models animated by their wearers, individuals taking part in group as well as singular traditions from the milk maids dances and green men in spring (the chimney sweeps as it happens) to finding (or capturing) a maypole for dancing, to say nothing of seasonal feasts provided by local landowners and gentry for their tenants and neighbours. I offer for comparison the more widely known religious traditions of Tibet as they until recently held communal religious and social activities which comprised thousands at a gathering, with elaborate ritualised dramas and with embroderies as large as hills, with weeks long events of one sort or another. Similar in commitment if not form were many among the earlier traditions of Merry England. nb book priced at ₤50 pprbk is doubtless worth it for the extensive research alone, but I got my copy well thumbed from a second hand book dealer. At the outset I had hoped for a more ‘traditionally’ pagan account of the ancient seasonal festivals, their origins and meanings. I was initially surprised and eventually delighted to find however that although this work is more of an Academic compote of facts and dates and included ongoing assessment of earlier authors often unfounded but sometimes inspirational conjecture than I had anticipated (of Sir James Frazer et al) nevertheless this is a very enjoyable, remarkably researched and admirably objective book-collection of essays. That much of this morass concerns the developments and impacts of constantly changing traditions due to Christian Reformation and Counter Reformation (certainly comedic at this distance in time), the ongoing process a seminal crucible (reminding me of both grail and cauldron) proved revealing, as the general view of folk traditions and their origins seems to usually favor the more arcane sources, this book by contrast documents only definite evidence, largely that of written records, of church, kirk and council across the land. With a nod to the Scandinavian Yuil, as well as the Roman Kalendae, we embark on an exploration of the traditions of Christmastide, the Twelve Days, the Rites of Celebration, Purification and of Charity which included the remarkable Clementing, Elementing and Souling, even Thomasing, Gooding, Mumping and Corning (as well as more) regional begging customs, by which means the poor would recant rhymes for contribution of food for a feast of their own. Similar appeals for reward included the Hocktide ‘heaving’ at Easter, in which gangs of men assaulted women for favor and groups of women also pursued and caught men for same, at its best a raising up on a lifted chair as proxy ‘Lord’ to commemorate the ascent of Easter, the surrogate released upon a reward of money or a kiss, at its worst a mere grasping by hands and throwing upwards as an occasion for assault and robbery. The ongoing exposition of numerous social customs of this kind, both dazzle the mind with their quantity, as well as provides a clear insight into how poverty was communally accepted, dealt with by innovative appeals to the community at large and that these were often ‘sanctioned’ by inclusion of some short Christian phrase in the introductory verse or chant. The author traces the development of such customs and portrays their eventual descent into more high spirited, reckless and even angry demands for assistance that could be met with threats and violence if not accepted. Once national schools were established and later a more centralized protection for the poor was introduced, such earlier community traditions dissipated further, demonstrating the authors argument throughout this book of the movement from a community sharing seasonal rituals and traditions including those aspects of display that were geared to earn rewards, to the de-socialization of such community into a society characterized by its more insular and private approach to seasons and their festivals or traditions. The Christianization of earlier traditions also has its place in this book, as for example the feast marking the end of winter and start of the summer months ahead at February 1st, Imbolc (the etymology of its name relating to ewes milk and thus new life) initially dedicated to the Irish goddess Brigid, but who was later morphed into the Christian St Bride. This is an important theme of both this book and of the mythological psycho-social developments of these Isles. Most surprisingly the often claimed genesis or inception of many Christian traditions in the pre Christian, infact seems to have increasingly worked in reverse. 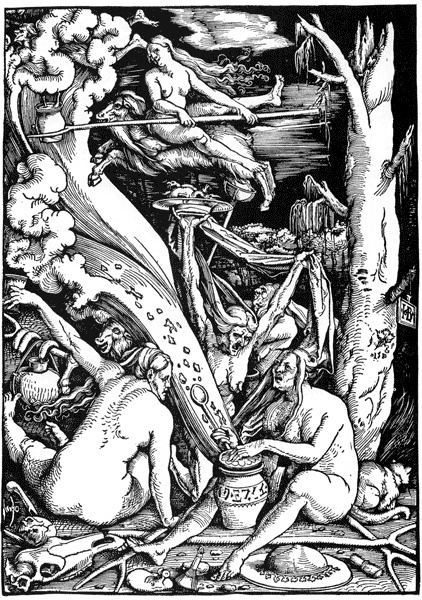 As religious conflicts in the land over changing orthodoxies developed, the Catholic tradition with its wealth of near magical rituals was vigorously being uprooted from the public and community sphere of practice by the ascent of the puritan Protestant, the ensuing personal spiritual void resulted in many cases in the earlier magical Catholic rituals being carried on privately at home and eventually (d)evolving into allegedly ancient ‘survivalist’ ‘folk-traditions’. Conversely, some of the Christianized traditions do appear to have had earlier sources such as the Rogationtide and Pentecost processions, at which time the people marched en mass around the crop fields, singing hymns at chosen stop points as the church ministers blessed the crops. 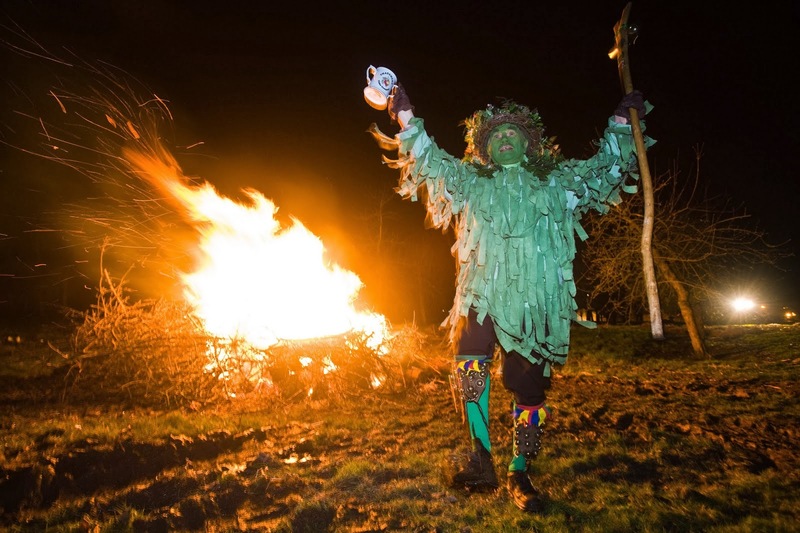 The book does feature ancient tradition where evidence has supported this, such as for example the affirmation of the Beltane as an accepted fire festival in certain regions of Northern Europe and the outlaying regions of the British Isles (unlike the later Samhain, for which evidence of a major ‘Celtic’ fire festival is less apparent). With greater detail due to the weight of evidence available however, Hutton explores the cultural progress towards our more modern current perspectives, for example plotting the development of the ‘May‘ (which unsurprisingly did have ancient antecedents in the delight of Spring returned) as people initially adorned self and home with garlands and greenery, which in time became a tradition of young women selling garlands, later children took over this role, and in their turn both to manage the unruly and the revenue these were eventually taken over by schools and local institutions. By contrast, the Mummers Plays with their essentially Christian derived themes of battle, death and resurrection, were more officially sanctioned groups from the outset and had less to do with earlier pre Christian traditions. Despite growing religious and institutional involvement in previously communal activities and traditions, the populace applied themselves with great enthusiasm to any occasion of social bonding, often at some cost to the societies they lived in (other than merely of money or means) such as the many community Maypoles stolen by rival villages and towns resulting in pitched battles between the two, the anarchic Saturnalia of Misrule as witnessed at the Shrovetide street ‘foot-ball’ games played across whole towns which could involve thousands of people and provided an occasion for licensed misrule resulting in damage to property and individual (although less violent than the serious riot and rebellion which was reserved for the Summer games as a time more suited for battle on the streets or field). The Church Ales or festivals also developed their Abbots of Unreason and a myriad practices of inversion and nonsense (Samuel Butler now we know where your inspiration came from). Charting how an apparently arcane ‘folk tradition’ once also considered a surviving pagan fertility rite had originated in high social circles of the Royal Courts and devolved into the rural communities, Hutton’s’ research into the Morris dancers is fascinating for its explanation of how we may create ‘new’ ancient traditions. Perhaps my favorite exposition in this work is that of the origins and evolution of The Jack in the Green, identified as a ‘survival’ of an ancient pagan fertility rite by the Frazerite Lady Raglan of the Folklore society in 1939, established on her view linking the dancing Green-Man in May day processions with the foliage faces on church walls. This was a lineage unresolved till 1979 Roy Judges study revealed the true origins to be somewhat less arcane, and linked them to a more traditional social ritual evolved as so many traditional customs of display were, to celebrate the new season with a display deigned to garner reward. To explain, during the17thC, London milkmaids danced the streets on May Day with their pails covered in flowers which symbolized the Springs new growth and so presented the promise of new grass for the cattle thus promising fresh milk, cream and butter. These displays earned them money as reward and therefore can be seen to serve a double purpose, of advertising their wares, as well a gathering much needed financial support after a lengthy winter without much income. They later left the pails for lighter wooden frames similarly covered in flowers and greenery, and later still were imitated in their greenery attired frames and street dancing display by the London Chimney sweeps whose claim for sympathy at this time was based on the end of winter cold meaning no more fires or work for them till next fall. Hutton surmises this work with a number of provocative and insightful observations, for example that the notion of a distinctive ‘Celtic’ ritual year with four festivals at the quarter days and an opening at Samhain, is a scholastic construction of the eighteenth and nineteenth centuries which should now be considerably revised or even abandoned altogether. Whilst the debt to a medieval, magical Catholicism seems to be growing apparent in my reading of serious studies of the origin of neo-pagan traditions, Hutton’s final words over the changing Christian influence upon the traditional festivals of the year are revelatory. ”evolution of a religious ideology …(had) produced a society imbued with a general taste for ceremony and acted as a means to endorsement of secular festivity. Finally that ‘the rhythms of the British year are timeless and impose certain patterns on the calendar customs’, to celebrate spring, to make merry in summer and draw close at fall, despite government and mass media atomization of community, seems a fair conclusion. Overall this book suggests to me that whilst certain traditions may not have an established ancient provenance, nevertheless because people are increasingly applying such meanings to the seasons cycles as an inherent pagan response to nature itself, we may now be seeing a further reversal of the community oriented neglect of seasonal festivals and a resurgence of a more nature based community oriented society at large. Not a book for the exclusively poetic or mythologically minded, but if read in the objective manner with which it is presented, this book provides a wealth of insight and understanding into the seasonal festivities as they have evolved in these British Isles and the influence they bear on modern pagan perspectives, Recommended. Set in a post Distopian society of a not too distant future, this film introduces the cause of bees and their integral value to the eco-sphere. Throughout history in many world cultures a mystical relationship to honeybees can be found. In the Ancient world the Great Mother was known as the Queen Bee and her priestesses were called Melissae. They served the Bee Goddesses and functioned as Oracles carrying the golden wisdom of the Goddess to her people. The honeycomb was even considered by the Greek Pythagoreans to be a symbol of the Goddess’ qualities of love and harmony, because of its hexagonal shape which in being composed of two triangles, one pointing upwards (Fire) and the other downwards, (Water) symbolized the perfect union between the opposites. The Druids of Northern Europe reverenced the bees for their ability to pollinate flowers and crops, which was regarded as a sacred charge because honey was seen as a precious gift from the Mother Goddess herself. Many Native American Indian tribes also used honey and other bee by-products, including the early Maya and Aztec Indians who kept bees and collected honey from the wild bees. However the bee population of North America and Europe is now in serious decline, which threatens disaster to our food crops as they are dependent upon the bees to pollinate them. The increase of commercial agriculture with its use of pesticides and destruction of wild plants and flowers upon which the bees forage upon contributed to this problem. Permaculture, based on ecological and biological principles, is a holistic approach to designing human settlements and agricultural systems that are modeled on the relationships found in natural ecologies, harmoniously integrating the land with all of its inhabitants. Whilst it is understood that earlier peoples did farm in cooperation with the Earth and her seasonal cycles, that for example the Druids in the North and other social leaders did much to manage and advise their communities on how and when to sow and tend crops and animals, following ‘modern’ Industrialization these techniques had been abandoned in favor of faster turn around of product for the market. In our time however, Bill Mollison, who could be called the instigator of a Quiet Revolution, launched with his book Permaculture One (1978) an international resurgence of land-use structured on cooperation with nature. Within this Permaculture system, the ecological processes of plants, animals, their nutrient cycles, climatic factors and weather cycles are all included, work is minimised, “wastes” become resources, productivity and yields increase, and environments are restored. 1. Earthcare – recognising that the Earth is the source of all life (is possibly itself a living entity — see the Gaia theory) and that we are a part of Earth, not apart from it. 2. Fairshare – in which animals are treated as co-habitators and co-workers of the Earth, eating foods normally unpalatable to people such as pests ie slugs and termites, and supplying valuable mineral rich fertilizer through their droppings. 3. Natural Energy use: e.g. employing a cave for preservation due to its ideally dry, dark and warm conditions, using the integration of co-operative crops rather than weeding as the growth of field flowers among corn allows the bees to better pollinate, and employing some ‘weeds’ to keep others at bay due to the nature of their chemical interaction with the soil, thus avoiding pesticides and chemicals which undermine the Earths ability to host its cycle of growths, in contrast to more usually practiced Industrial Agriculture which intensively exploits the soil, plants and animals.